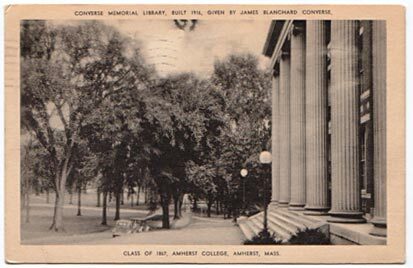 Converse Hall, formerly Converse Memorial Library, was built in 1916-17 with funding from a gift of Edmund C. Converse, in memory of his brother James. 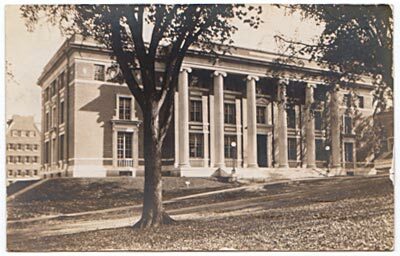 James Kellum Smith '15 of McKim, Mead & White designed an extension on the building that was added in 1937-38 (King, 320-21). When Frost Library was built in 1965, it replaced Converse as the College's library. Converse is presently home to many college offices, including the Registrar's Office, the President's Office, and the Financial Aid Office. A number of events are held there each year, including the Freshman A Cappella Show as well as exhibitions and lectures. Classrooms occupy the rest of the building, including the Red Room lecture hall.